In addition to email, you can also create a new Buffer account using your Twitter account, Facebook Profile, or LinkedIn Profile. Choosing one of these options will automatically connect that social account to your Buffer Publish account. If you’d like to manage your social sign-in settings for your account, you can always do that by heading over to the My Account link at the top right of your Buffer dashboard and selecting Access & Password from the dropdown menu. From there, locate the Social Sign In section and toggle on or off your connected social accounts. If you happen to share a social account with another person or a team of associates, you may want to consider turning off social sign-in for that one. 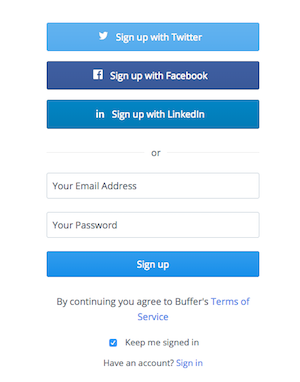 This will help make sure your Buffer account is only accessible to you. If you decide to keep social sign-in enabled for shared accounts, it’s important to know that your entire Buffer account may be accessible to anyone who has the login credentials for your shared accounts. [Publish] Why are posts added by my team member going directly into the Queue, rather than being submitted for approval?